Audio Technica ATN150MLX Stylus Stylus ATN150MLX MicroLine® Replacement S.. Audio Technica ATN150SA Stylus Stylus ATN150SA MicroLine® Replacement Sty.. Audio Technica ATN3472P Stylus Stylus ATN3472P Replacement conical stylus for AT300P.. Audio Technica ATN3472SE Stylus Stylus ATN3472SE Replacement elliptical stylus fo.. Audio Technica ATN3600L Stylus Stylus ATN-3600L ATN3600L Stylus Replacement styli.. Audio Technica ATN440MLa Stylus Stylus ATN440MLa Χειροποίητη ανταλλακτική βελ.. Audio Technica ATN440MLb Stylus Stylus ATN440MLb Χειροποίητη ανταλλακτική βελ.. Audio Technica ATN91 Stylus Stylus ATN-91 Replacement stylus for AT91 cartridge R.. Audio Technica ATN95E Stylus Stylus ATN-95E Replacement stylus for AT95E cartridge .. 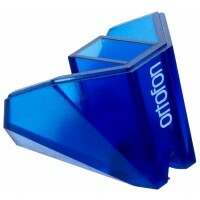 Audio Technica ATP-N2 Stylus Stylus ATP-N2 Replacement stylus for ATP-2 cartridge..
Ortofon 2M Black Stylus Fine Line Diamond Stylus Fine Line Diamond 2M Black&n..
Ortofon 2M Blue Stylus Eliptical Diamond Stylus Eliptical Diamond 2M Blue Stylus ..
Ortofon 2M Bronze Stylus Fine Line Diamond StylusFine Line Diamond 2M Bronze Stylu..
Ortofon 2M Red Stylus Eliptical Diamond Stylus Eliptical Diamond 2M Red ..
Ortofon 2M Stylus Mono Eliptical Diamond Stylus Mono Eliptical Diamond Ortofon 2M Stylu..